I want it just for the box! Going for most dedicated because I’m not eligible Good luck to all the UK ladies!! So lovely, enter me please! pleeeeaaase enter me into this!! would love to win!! a lovely treat for feet – yay! Please enter me for the draw – thanks! Not eligible! The packaging is gorgeous on this one! my feet have never been pampered, hint hint! this is sooo pretty too! Most dedicated please? Good luck U.K. ladies! Oooh, I wish I was eligible! not eligible, but awfully dedicated! Not eligible to win this, but i would like to win the “most dedicated”…Good luck to all the UK ladies. 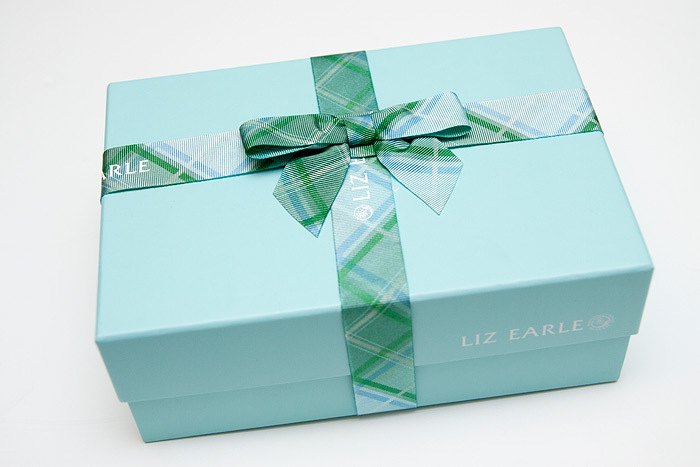 Now Liz Earle… Why are the nicest thing in UK not for me? I love how LE package their products! Please enter me! I’m in the uk! thank you! Enter me please Looks lovely! Please enter me. Liz Earle is fantastic! that is SUCH a gorgeous box!! thanks for the giveaway! That looks amazing. Please enter me, thank you! Not in the UK but dedication is whatchooneed! My feet absolutely need this! Enter me please! Ooh, would love to win that box of goodies. Ooh enter me too please! Of all the liz earle stuff I’ve tried it hasn’t been the foot products. So this would be great to win. I would totally LOVE this, please enter me! ENter me please- another fab giveaway! Congratulations on your well deserved award gorgeous girl!!! That’s beautifully presented, I love it that feet get such a luxury treat. *looks at own feet in giant fluffy socks* Yeah. i love the product, but i am not eligible. Enter me please, my feet definitely need some TLC! I wish I could wrap like that too, how beautiful is that! What a gorgeous giveaway. Aw dang! Not eligible but this looks amazing. My feet would love this! Enter me please, many thanks. Love Liz Earle! enter me, please! never tried liz earle before so fingers crossed! Enter me please, it looks like a beautiful prize! Not eligible, but it looks great. I love boxed sets, they look so pretty. sad, sad, sad….that I can’t enter. I so want to try Liz Earle!!!! Enter me please. I love a bit of Liz Earle. I would love to try Liz Earle’s foot products. Have only ever tried stuff for the face, and I love them! Yay to pretty feet! sign me up.. please? Oh wow, how lovely is that! I would love a foot pamper sesh! My feet are taking a beating as I am training for a 5k so this would be most welcome! Oh this looks lovely. Please enter me.